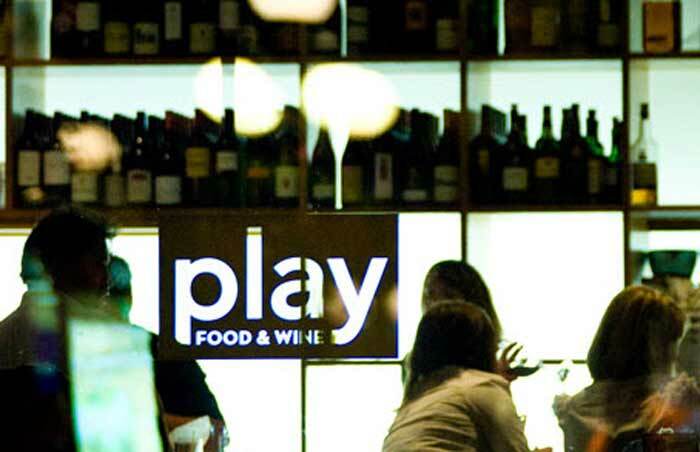 At Play Food & Wine in the Byward Market you can enjoy fine dining — without the overly formal atmosphere. OTTAWA – As children, we’re always told not to play with our food. But as I found out during a visit to Play Food & Wine in Ottawa, being playful with culinary creations may just be what we need in the often stuffy Canadian fine-dining scene. Hues of blue and ceilings draped in red meet us as we walk into Play. Along the entrance walls, the empty wine bottles of past patrons are encased in glass and adorned with handwritten anecdotes and signatures on the labels. As we wait to be seated, we’re amused by the (most likely drunken) handwritten messages from Rick Mercer and the like. A creation of chef Michael Moffat and Stephen Bekta (co-owners of Bekta, one of Ottawa’s finest restaurants), Play specializes in sharing plates and wines by the glass. This enables diners to indulge in several options from the constantly changing menu. We settle into our seats and prepare for a long, relaxing meal. With an upstairs open-kitchen dining room as well as the downstairs seating area, Play offers a pretty spacious venue in Ottawa’s Byward Market. Chef de cuisine Katie Browne joins us soon after we’re seated. If Play Food & Wine is all about promoting relaxation and fun into everyday fine dining, this chef seems to personify both words. Kind, personable and well spoken, and just 26, Browne seems to have her finger on the culinary pulse of the city. Working in pub restaurants, where she started, didn’t exactly make her excited about food. It was when she was introduced to more sophisticated dining that she realized cooking could be a truly fulfilling career. After working closely with Moffat at Bekta for several years, she became the obvious choice to run the kitchen at Play. Browne disappears to prepare our first course, leaving us to enjoy the surroundings and savour our wine. Soon enough our table is set with our first three tasting plates: a creamy bacon buratta ($11) adorned with hazelnut pesto and a light trickle of truffle oil with crisp crostini to sop the whole thing up, smoked salmon ($12, but no longer in season as of publication) delicately placed atop salt-roasted beets and sprinkled with crisp dill-flavoured potato chips and a grilled squid that had been marinated in olive brine, served with confit tomato, orange gastrique and arugula. Although I enjoy every dish, the buratta really comes out on top. The creamy, delectable cheese combined with just the right amount of truffle and a great crunch and earthiness from the hazelnut almost brings a tear to my eye. With several courses yet to arrive I come to the realization that Browne, despite her youth, can cook. With a fresh glass of wine came our second course. Two plates — a quinoa-stuffed grilled quail with a chunky grape sauce and a beef tataki served with a spicy habanero jelly. The beef is lightly seared and so thinly sliced that it melts in your mouth. The quail was well executed, although the quinoa stuffing is slightly lost among all the other bold flavours. I ask Browne the reasoning behind the sharing-plate menu. “When dining out, a lot of people want to try what’s on each other’s plates. The beauty of having a sharing menu is that our guests can try a variety of things without having to commit to a main course,” she says. The same can be said for the wine menu, which has plenty of “by the glass” options for those who want to try different varieties with their plates. By the time our third course comes around we’re on our third glass of wine — a spritely Sauvingnon Blanc from California — and we’re loving it. A plate of gnocchi gets set before us alongside a dish of British Columbia cod. The cod comes with a flavourful mixture of chorizo, fava beans and king oyster mushrooms, and is topped with a dollop of a very light green olive sauce. The combination of flavours and abstract textures make this the winning dish of the evening. Although the gnocchi ($13) is perfectly cooked, it lacks the cod’s wow factor. We are officially hooked on this dish. When Browne comes to check in on us she gives a few reasons why she thinks Ottawa is a great place to be a chef. This chef’s enthusiasm is beginning to get to me (or maybe it’s glass of wine No. 4). After three fabulous courses, I can understand why the idea of sharing plates is so enticing. Picking out what you like here and there, sipping well-paired glasses of wine (Play’s wait staff are well educated on the wines offered on the menu) and lingering around the table with good friends and conversation make for a great dining experience. For an additional pairing with our Sauvingnon Blanc (Benzinger, Sonoma County, 2010) we are presented with a cheese platter featuring three cheeses from Quebec and France. My personal favourite? La Cendrillon from St. Raymond de Portneuf, Quebec. Named best cheese in the world in 2009, this creamy goat cheese is slightly sweet and tangy with an edible ash rind. The perfect pairing for the white. As if, at this point, we had room for dessert! But they brought out three dishes nonetheless. I’m immediately drawn to a banana mousse ($7) served in a phyllo pastry cup. Beer nuts are sprinkled over the top. The mousse is the perfect ending to the meal (although the butterscotch pudding is a contender) — light and airy, sweet and creamy. Play Food & Wine offers the prospect of eating well-executed cuisine in an atmosphere that is relaxing and not stuffy at all. Quite frankly, I would take that over fine dining any day of the week. Oh, and one last thing: order the cod. Janine is Vacay.ca's Food Columnist. Growing up in a tiny farming community on Cape Breton Island, Janine knew at a young age that she was destined for travel and as a young girl would spend hours poring over her father’s outdated globe, dreaming of the places she would someday visit. Twenty-something years later, she is now based in Toronto where she works as a chef and writer, having travelled throughout Asia, Canada and Ireland (with more trips to come!). Where’s the beef for the 2012 Calgary Stampede?